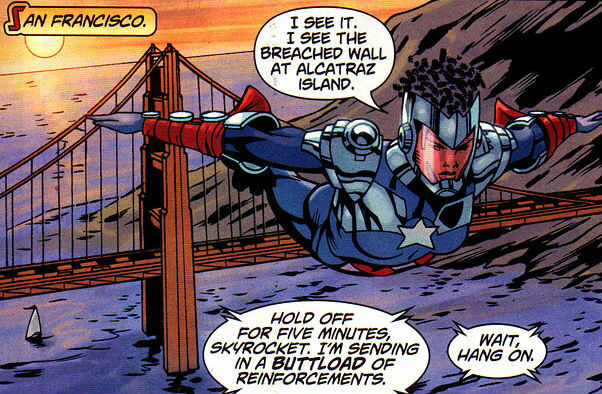 This week’s minorities in cartoons entry is Skyrocket, a DC Comics superheroine. Skyrocket (real name: Celia Forrestal) first appeared in “JLA” #61 (February 2002). Kurt Busiek and Tom Grummett created Celia. Celia’s backstory states she grew up in St. Louis, where her parents were scientists working for Argo Technologies. She was a lieutenant in the United States Navy. However, Celia faced limited promotional prospects, and was thinking of leaving the service. Subsequently, Celia visited her parents for advice. In turn, Celia’s parents showed her the “Argo Harness,” a prototype exoskeleton battlesuit they were working on. The family was suddenly attacked by the terrorist group Scorpion, who wanted the Harness technology for their own purposes. Celia’s parents were killed in the attack. She eventually brought their killers to justice, with the help of another hero, Green Lantern (Hal Jordan). After her parents’ funeral, Celia pondered what to do next; on the suggestion of Hal, Celia decided to use the Harness to become the superheroine Skyrocket. While working in a fast food restaurant in St. Louis, Celia was eventually recruited by Josiah Power for his Power Company of for-profit superheroes. However, she insisted on also doing as much heroic work as possible for free. Skyrocket’s yet to reappear since the 2011 New 52 reboot, or appear in spin-off media. Skyrocket’s abilities, via her suit, consist of flight and the ability to manipulate and capture energy of various types, including radiation, heat, and electromagnetism.